Epom Market Interstitial, Rich Media, Banner advertising network details. Epom Market is an advertising designed for multi-screen advertising to provide multiple opportunities of online advertising. The platform is focused on promoting, monetizing and growing your brand using Native Mobile Ads or Desktop Ads. 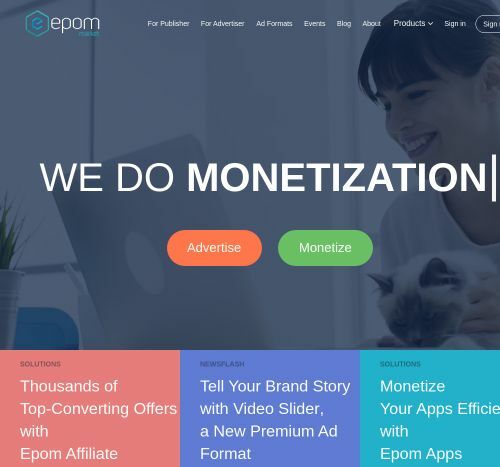 Epom Market has a variety of apps such as ad mediation platform, in order to increase monetization. The self-serve Platform works with DSP technology and programmatic advertising. Their Video ads are designed interactively and perfectly integrated into websites. Check the reviews on Affbank about Epom Market and for any details regarding their Target Audience, Pricing Models and Advertising Formats, reach the Information section.